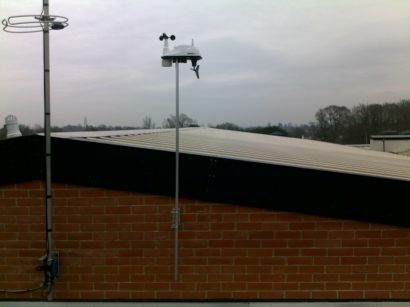 In the Summer of 2009 I decided that the purchase of an automated weather station (AWS) would improve the teaching and learning of weather and climate at our school. I spent my holidays trawling the internet for various options, and two years later, I can say that it has exceeded our expectations and has influenced a much wider community. I got the idea from seeing a few disorganised weather pages that many schools published, often with old or discontinued weather data supposedly streaming live to their home pages. This was a missed trick. The potential was huge in the learning environment and so I started to look at various options. I soon had arranged an appointment to visit a local primary school that had an AWS installed and felt inspired when I saw it in the field. The computer technician was given the honourable job of the custodian of the station and she duly obliged to show me how it operated, logged data and then broadcast it to the internet. The school children, however, didn’t seem to be using it to its full potential. John recommended the Davis Vantage Vue AWS with the Weatherlink IP data logger and software. This allowed the data to be published live to a website without the need for any running software or PCs at all. I spoke to the teacher in charge of the STEMNET (Science, Technology, Engineering and Maths Network) budget and he agreed that it would be a useful piece of kit. He kindly agreed to fund the project. After writing a lengthy justification proposal to the senior team of staff I soon gained their permission and full support. After a quick phone call to John at Prodata, the deal was done and on 25th November 2009 the parcel arrived like an early Christmas present. Prior to opening I had downloaded the Vue manual and prepared myself for its setup. I felt that this was crucial, as often mistakes can be made in the excitement and the correct sequencing of battery insertion, button pushing and assembling was thoroughly drilled into my head. It was crucial that I checked that the school network could allow data to flow both ways to the internet. Port number 80 is a common port that is blocked in schools and this was soon opened by the South East Grid for Learning, with help from our ICT team. This took approximately two weeks to ‘complete’ and so I was pleased that the wait was before installation. I also gave the weather station a fixed IP address so that it easily reverted back to it after a network failure. I was fortunate enough to have the help of one of the school caretakers, who helped me to attach the AWS to a TV aerial bracket that we securely screwed to the roof of the Humanities roof. I was fully aware of the meteorological limitations of measuring temperature on the felt roof and mounting the rain gauge in a place where wind may disrupt it – but that was not the essence of the project. We were not collecting data for the Met Office and it was more important that we had the ability to do so. The discussions about the limitations of the site still make a great learning task for the pupils. In situ on the Humanities roof, facing South for solar energy to supplement the Lithium battery use. Within 30 minutes the job was done and after a few clicks the data was streaming live to our own Weatherlink website. The data is simply displayed with nothing too ambitious. The option of bells and whistles would come later. The website screen hosted by Davis – live data literally streaming within minutes to your unique web address supplied by Davis. I run an after-school ‘Weather Club’ for 11-13 year olds, who meet once a week to discuss and learn about all things meteorological. They were very pleased and genuinely excited that we had our own weather station on the roof. We frequently use the data collected by the station in the club and also in our lessons. The cross curricular links with ICT, Maths and Science are clear to see – we often construct graphs in Excel of the data and post ideas in forums or wikis on our school’s Virtual Learning Environment webpage. The AWS took another leap into fame when the Geography Department purchased some weather forecasting software called WXSIM, that uses the station’s real data and also that from surrounding AWSs in the military, aviation and private user fields. It even has the capability to ‘learn’ and correct errors based on historical errors. Soon the school was automatically running three forecasts a day and the local borough and town councils were using the forecast on their website front pages. Environmental groups have shown an interest and the station has featured in three local papers. The website took approximately 4,000 hits in January 2010 when pupils, staff and parents bombarded the site waiting the school to announce a snow closure! Visits have been made to the site from more than 50 different countries around the world, mostly due to the station being listed in various other station website lists of links, or indeed on the Royal Met Society’s education page. Our five day forecast using the station’s own data and a network of resources in the area. The school strengthened its community cohesion further when ‘Weather Club’ ventured to a local feeder primary school to host a ‘Weather Workshop’ with 9 year old pupils. Soon Sixth Formers were volunteering to help assist at Weather Club and we have recently hosted two guest speakers from the Met Office. Lessons in the department use the data collected from the station and also I frequently receive emails from members of the public commenting on the usefulness of the data and forecasts. 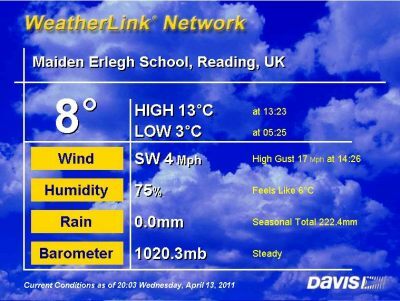 I felt that it was essential for its continuing success that the ‘weather station’ part of the school’s website was not password protected and was fully in the public domain. More recently I have upgraded from the included Weatherlink software to an alternative piece called Weather Display which has given us the option of creating many more automatically generated graphs and statistics that are displayed on the site. I have also finally gained permission to run a low spec PC 24/7 in my office so that the forecasts and graphs can self generate, even in the school holidays. Another latest addition is the inclusion of a webcam image that gives an indication of the snow depth in the car park or the cirrus clouds drifting across the view from my office window. Again, this helps to create interest of weather surfers on a local, regional and global scale. Comparing this year’s temperature plot to last year’s – only one of a whole multitude of graphs made possible by purchasing Weather Display. Wind rose and live data screen courtesy of Weather Display software. The project has been testing at times, with network failures or reboots being my nemesis, but the wealth of knowledge and interest that the station has given the school and community immensely outweighs the times I have to reset the logger, make a post in a help forum or fire an email off to John.